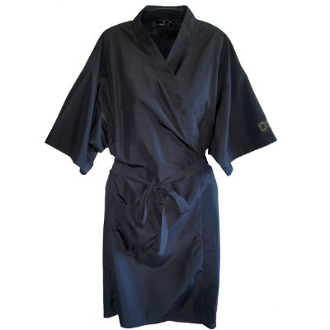 Pamper your client by wrapping them in this beautiful robe. Made in DuraSilk™ Classic material that is soft, silky, and luxurious. Lightweight, Kimono-wrap style that will adjust to fit most sizes. Bleach and stain resistant fabric that holds its color wash after wash. This Light weight, cool and comfortable material keeps your client fully covered. Secure interior tie as well as exterior belted tie for full coverage. Easy Care, machine wash. One size fits most.